Yes, you are right. It is a temple, that too, a functional temple right under the sea in a place called Koliyak in Bhavnagar in the state of Gujarat in North Western India. 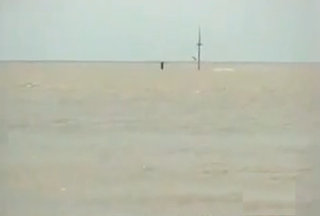 Every day, when the tide is high, only a mast and a flag are visible from the coast. Then, when the waters recede, they reveal a wondrous Shiva temple which is now accessible to the eagerly waiting devotees at about one and a half km into the sea. Lord Shiva is the deity at this temple; He is called the Nishkalank or pure Shiva-free from imperfections. Devotees throng this place of worship with offerings during the tide recession and hurry back in time before the tide builds up again. The demand for auspicious Darshan of the Lord peaks during the new moon phase and the full moon phase, when the tides are also most powerful- but then such is the faith of the Shiva bhakts (devotees) that they are prepared for long waits. It is believed that the Pandava brothers of Mahabharat fame wanted to atone for the perceived sins in killing their adversaries in the epic battle. When they approached their Guru, mentor and Lord, Sri Krishna,He,out of deference to their beliefs, suggested to pray to Lord Shiva and be guided by Him. Their endeavors led them finally to this marvelous temple, where the pleased Lord Shiva is said to have presented Himself to each of the five Pandavas in the form of a Linga, which explains the five Lingas there. Koliyak is about 24 km from Bhavnagar by road. For more details, the official website of Gujarat Tourism may be visited please.